Sighthounds, which follow prey by keeping it in sight. This type of dog is very fast and will catch and kill or immobilize the game themselves. Scent hounds, use acute scenting powers to track prey; they may air scent, ground scent or both. This type of dog have endurance, but are not fast runners. Aboriginal hounds, which follow prey by equally using sight, scent, and hearing. 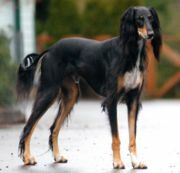 This type of dog is fast and has endurance, but it is not as fast as sighthounds. Sighthounds, also called gazehounds, are hounds that primarily hunt by speed and sight, instead of by scent and endurance, as scent hounds do. These dogs specialize in pursuing prey, keeping it in sight, and overpowering it by their great speed and agility. They must be able to quickly detect motion, so they have keen vision. Sighthounds must be able to capture fast, agile prey such as deer and hare, so they have a very flexible back and long legs for a long stride, a deep chest to support an unusually (compared to other dogs) large heart, very efficient lungs for both anaerobic and aerobic sprints, and a lean, wiry body to keep their weight at a minimum. The typical sighthound also has a light, lean head, which is referred to as being dolichocephalic in its proportions. This shape can create the illusion that their heads are longer than usual. Dolichocephaly is actually a characteristic of wolves and other wild carnivores, and is related to the need for stereoscopic vision in active hunting. For reasons not yet understood, most domesticated animals including dogs (other than the sighthounds) have become brachycephalic—short-headed—and have partially lost this aspect of their field of vision (see cephalic index). Sighthounds such as the Saluki may have existed for at least 5,000 years, with the earliest known sighthounds appearing in Eurasia. The earliest description of a sighthound in European recorded history comes from Arrian's Cynegeticus, of the 2nd century AD. Although today most sighthounds are kept primarily as pets, they have been bred for thousands of years to detect movement, chase, capture, and kill prey primarily by speed. They thrive on physical activity. Some have mellow personalities, others are watchful or even hostile towards strangers, but the instinct to chase running animals remains strong. Wikipedia contributors, "Sighthound," Wikipedia, The Free Encyclopedia, http://en.wikipedia.org/w/index.php?title=Sighthound&oldid=139211251 (accessed July 1, 2007). Scent hounds are hounds that primarily hunt by scent rather than sight. They are generally regarded as having some of the most sensitive noses among canines. These dogs specialize in following a smell or scent. 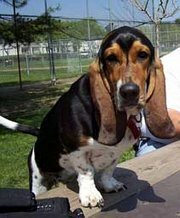 Most of these breeds have long, drooping ears. One theory says that this trait helps to collect scent from the air and keep it near the dog's face and nose. They also have large nasal cavities, the better to process scent. Their typically loose, moist lips are said to assist in trapping scent particles. Most of these breeds have deep, booming voices and use them actively when running, and especially when following a scent trail. Although this is a nuisance in settled areas, it is a valuable trait that allows the dog's handler to follow the dog or pack of dogs during a hunt even when they are out of sight, such as when following a fox through woodland. Scent hounds do not need to be as fast as sighthounds because they do not need to keep prey in sight, but they need endurance so that they can stick with a scent and follow it for long distances over rough terrain. The best scent hounds can follow a scent trail even across running water and even when it is several days old. Most scent hounds, even when kept as pets, still are happiest when following a scent trail. Most scent hounds were used for hunting in packs, sometimes with multiple dogs in a single pack. Longer-legged hounds ran more quickly and usually required that the hunters follow on horseback; shorter-legged hounds allowed hunters to follow on foot. Wikipedia contributors, "Scent hound," Wikipedia, The Free Encyclopedia, http://en.wikipedia.org/w/index.php?title=Scent_hound&oldid=141097860 (accessed July 1, 2007). Aboriginal hounds, which follow prey by using sight, scent, and hearing. This type of dog is fast and has endurance, but it is not as fast as sighthounds on the chase. Wikipedia contributors, "Hound," Wikipedia, The Free Encyclopedia, http://en.wikipedia.org/w/index.php?title=Hound&oldid=139480917 (accessed July 1, 2007). We encourage the potential dog owner to fully investigate individual breed and bloodline characteristics before acquiring a new dog. We will continue to add to and update this section over time. Call 203.232.8018 or email John to discuss how we can help you and your herding dog live happily ever after.